Dr Toal’s work has helped establish Critical Geopolitics as a recognized research field within contemporary Political Geography. In 1996 he published Critical Geopolitics (published by the University of Minnesota Press in the US and by Routledge worldwide). Together with fellow political geographers Dr Simon Dalby and Dr Paul Routledge, he edited two editions of The Geopolitics Reader (Routledge, 1998, 2006). Dr Toal’s early articles on critical geopolitics can be divided into four categories, those on the history of geopolitics, on the contemporary geopolitical tradition, on critical geopolitics theory, and on contemporary geopolitical affairs. Dissatisfied with working mostly at the global scale only, Toal shifted the focus of his work in 2002 to the localized contexts within which geopolitical processes unfold (in actuality a re-visiting of early interest in the geography of Irish nationalism). His work in Bosnia-Herzegovina and the Caucasus are the product of this evolution. He tied this work on ‘localized geopolitics’ to Critical Geopolitics in G. Ó Tuathail, “Localizing Geopolitics” Political Geography 29 (2010), 256-265 (Special issue on ‘The State of Critical Geopolitics’). For those unfamiliar with some early Critical Geopolitics, below are links to some of Toal’s publications from the 1990s (Dr Simon Dalby’s early publications, and that of other political geographers, are also essential reading on this period). G. Ó Tuathail, T. Luke (1994) Present at (Dis)Integration: Deterritorialization and Reterritorialization in the New Wor(l)d Order. Co-authored with Dr. Timothy W. Luke. Annals of the Association of American Geographers 84, 381-398. G. Ó Tuathail (1997) At the End of Geopolitics? Reflections on a Pluralizing Problematic at the Century’s End. Alternatives: Social Transformation and Humane Governance 22, 1, 35-55. T.W. Luke and G. Ó Tuathail (1997) On Videocameralistics: The Geopolitics of Failed States, the CNN International and (UN) Governmentality. Co-authored with Dr. Timothy Luke. Review of International Political Economy (RIPE) 4, 4, 709-33. G. Ó Tuathail (1997) Emerging Markets and Other Simulations: Mexico, Chiapas and the Geofinancial Panopticon. Ecumune. 4, 3, 300-317. G. Ó Tuathail (1998) Deterritorialized Threats and Global Dangers: Geopolitics, Risk Society and Reflexive Modernization. Geopolitics. 3 (1), 17-31. Also published as a chapter in Boundaries, Territory and Postmodernity, ed. David Newman. London: Frank Cass, 1999. G. Ó Tuathail, A. Herod and S. Roberts (1998) Unruly Problematics: Globalization, Governance and Geography. Introductory chapter to An Unruly World? Geography, Globalization and Governance, eds. Andrew Herod, Gearóid Ó Tuathail and Susan Roberts. Routledge, 1-24. G. Ó Tuathail, T. Luke (1998) Global Flowmations, Local Fundamentalism, and Fast Geopolitics: “America” in an Accelerating World Order. Chapter in An Unruly World? Geography, Globalization and Governance, eds. Andrew Herod, Gearóid Ó Tuathail and Susan Roberts. Routledge, 72-94. G. Ó Tuathail and T.W. Luke (1998) The Fraying Modern Map: Failed States and Contraband Capitalism. Co-authored with Timothy W. Luke. Geopolitics. 3 (3), 14-33. G. Ó Tuathail (1999) Borderless Worlds: Problematizing Discourses of Deterritorialization in Global Finance and Digital Culture. Geopolitics. 4 (2). Also published as a chapter in Geopolitics at the End of the Twentieth Century: The Changing World Political Map, eds. Nurit Kliot and David Newman. London: Frank Cass, 2000. G. Ó Tuathail (2000) The Postmodern Geopolitical Condition: States, Statecraft, and Security into the Twenty First Century. Annals of the Association of American Geographers. 90 (1), 166-178. Also translated into German. G. Ó Tuathail (1992) Putting Mackinder in his Place: Material Transformations and Myth. Political Geography. 11, 100-118. G. Ó Tuathail (1994) The Critical Reading/Writing of Geopolitics: Re-Reading/Writing Wittfogel, Bowman and Lacoste. Progress in Human Geography 18, 313-332. A. Crampton, G. Ó Tuathail (1996) Intellectuals, Institutions and Ideology: The Case of Robert Strausz-Hupé and American Geopolitics. Political Geography 15, 553-556. G. Ó Tuathail (2000) Spiritual Geopolitics: Father Edmund Walsh and Jesuit Anticommunism. In Geopolitical Traditions, eds. Klaus Dodds and David Atkinson. Routledge. G. Ó Tuathail, S. Dalby (1994) Critical Geopolitics. Co-editor’s introduction to a special issue on critical geopolitics. Environment and Planning D: Society and Space. 12, 513-514. S Dalby, G. Ó Tuathail (1994) The Critical Geopolitics Constellation: Problematizing Fusions of Geographical Knowledge and Power. Co-editors introduction to the special issue on Critical Geopolitics, Political Geography. 15, 451-456. G. Ó Tuathail (1994) (Dis)placing Geopolitics: Writing on Maps of Global Politics. Environment and Planning D: Society and Space 12, 525-546. G. Ó Tuathail (1994) Problematizing Geopolitics: Survey, Statecraft and Strategy. Transactions of the Institute of British Geographers 19, 259-272. G. Ó Tuathail (1995) Political Geography I: Theorizing History, Gender and World Order Amidst Crises of Global Governance. Progress in Human Geography 19, 260-272. G. Ó Tuathail (1996) Political Geography II: (Counter) Revolutionary Times. Progress in Human Geography 20, 404-412. G. Ó Tuathail (1998) Political Geography III: Dealing with Deterritorialization. Progress in Human Geography. 22, 81-93. 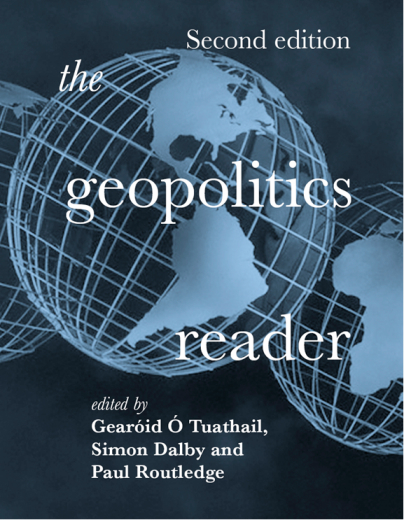 G. Ó Tuathail, S. Dalby (1998) Re-Thinking Geopolitics: Towards a Critical Geopolitics. Introductory chapter co-authored with Simon Dalby to Rethinking Geopolitics, Routledge, 1-15. G. Ó Tuathail (1998) Postmodern Geopolitics? The Modern Geopolitical Imagination and Beyond. Chapter in Rethinking Geopolitics, eds. Gearóid Ó Tuathail and Simon Dalby. Routledge, 16-38. G. Ó Tuathail (1999) Understanding Critical Geopolitics: Geopolitics and Risk Society. Journal of Strategic Studies. 22 (2/3), 107-124. Also published as a chapter in Geography, Geopolitics and Strategy, eds. Geoffrey Sloan and Colin Gray. London: Frank Cass, 1999. G. Ó Tuathail (1999) A Strategic Sign: The Geopolitical Significance of Bosnia in U.S. Foreign Policy. Environment and Planning D: Society and Space. 17, 515-533. T.W. Luke, G. Ó Tuathail (2000)Thinking Geopolitical Space: The Spatiality of War, Speed and Vision in the Work of Paul Virilio. Co-authored with Dr Timothy W. Luke, Political Science, Virginia Tech. Chapter in Thinking Space, eds. Mike Crang and Nigel Thrift. Routledge. G. Ó Tuathail (2003) Geopolitical Structures and Cultures: Towards Conceptual Clarity in the Study of Critical Geopolitics.In Geopolitical Perspectives on World Politics, ed. by Lasha Tchantouridze, Bison Paper 4, Winnipeg : Centre for Defence and Security Studies, November 2003. G. Ó Tuathail (1986) The Language and Nature of the “New” Geopolitics: The Case of US – El Salvador Relations. Political Geography Quarterly 5, 73-85. G. Ó Tuathail (1992) Foreign Policy and the Hyperreal: The Reagan Administration and the Scripting of “South Africa.” In Written Worlds: Text, Metaphor and Rhetoric in the Representation of Landscape, eds. James Duncan and Trevor Barnes. Routledge. G. Ó Tuathail (1992) The Bush Administration and the “End” of the Cold War: A Critical Geopolitics of US Foreign Policy in 1989. Geoforum. 23, 437-452. G. Ó Tuathail (1992) ” Pearl Harbor Without Bombs”: A Critical Geopolitics of the US-Japan “FSX” Debate. Environment and Planning A. 24, 975-994. G. Ó Tuathail (1993) Japan as Threat: Geo-Economic Discourses on the US-Japan Relationship in US Civil Society, 1989-1991. Chapter in The Political Geography of the New World Order, ed. Colin Williams. Belhaven. G. Ó Tuathail (1993) The Effacement of Place? US Foreign Policy and the Spatiality of the Gulf Crisis. Antipode 25, 4-31.Article reprinted in Political Geography: A Reader, edited by John Agnew (London: Edward Arnold, 1996). G. Ó Tuathail (1993) The New East-West Struggle? Japan in the Bush Administration’s “New World Order.” Area 25, 127-135. G. Ó Tuathail (2003) “Just Out Looking for a Fight”: American Affect and the Invasion of Iraq. Antipode 35, 5. G. Ó Tuathail (2005) Geopolitics and State Building: An Interview with Peter Galbraith. Geopolitics 10, 167-183. G. Ó Tuathail (2005) Contradictions of a “Two-State Solution.” Arab World Geographer 8, 3, 168-171.